Wordle is a resource for generating “word clouds” from text that you provide. The clouds give greater prominence to words that appear more frequently in the source text. You can tweak your clouds with different fonts, layouts, and color schemes. The images you create with Wordle are yours to use however you like. You can print them out, or save them to the Wordle gallery. 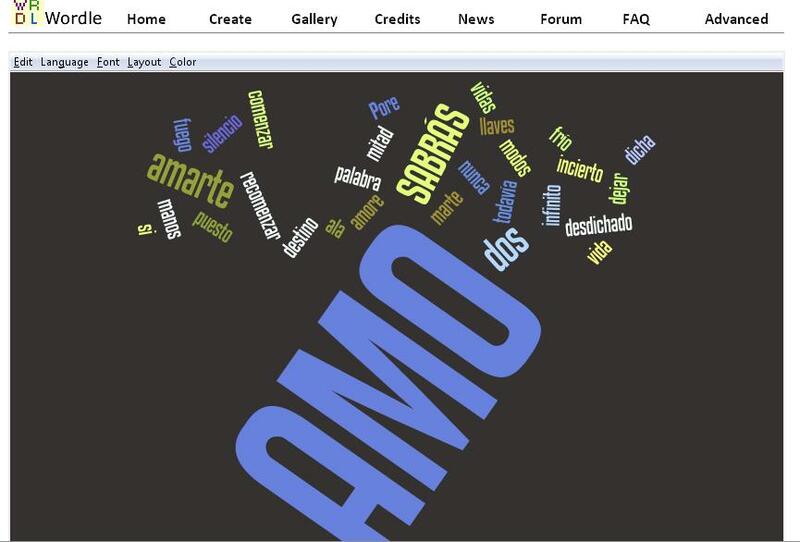 These word clouds can be used as a pre-reading activity in a a second language. Students can look for the most prominent words and begin to decipher what the text will be about. Student writing can also be put into a word cloud and you can have other students visually look at the text. There are many interesting uses for this free tool. Mi amore tiene dos vidas para amarte. This entry was posted in Online Activities, Reading, Technology and tagged image, poem, Reading, wordle, Writing. Bookmark the permalink.